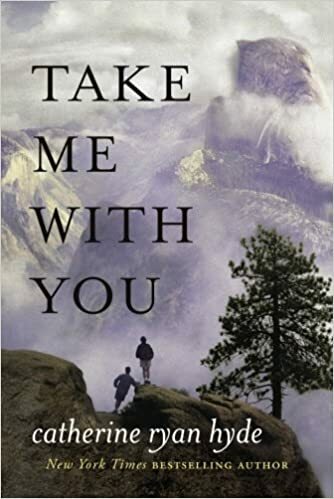 This is my review and thoughts on Take Me With You by Catherine Ryan Hyde. 1. A journey in literature is a classic metaphor for an inward journey (think The Odyssey). In what way is August’s trip in Take Me With You an emotional or psychological one? Describe August Schroeder’s state of mind at the beginning of the novel and how he changes by the end of the trip. August actually got super annoying by the end of the book and I did not enjoy his character. I get that the author was trying to show that it was because August cared about Seth that he was so stressed about the climbing. I get that Seth may not have appreciated that, or been used to it, because his own father was not supposedly as good as August. I did not like the route that the book took. So I did not enjoy the journey that August took. 2. What kind of father is Wes and what is his relationship with his sons? Apparently, not that hands-on. He cares, but has his issues with alcohol. Apparently, as was beaten over our head, he was jealous of August. Other than those few tidbits, we know nothing of Wes. 3. Why does August initially decline to take Seth and Henry with him to Yellowstone? What causes him to change his mind? Is it simply a matter of money? Um, duh. He declines to take the boys because it is so completely unrealistic to take two boys on vacation with you when you just met them. What causes him to change his mind are the boys and their earnest hopes to go with him. 4. How would you describe the two boys, Seth and Henry, and their relationship as brothers. Why doesn’t Henry talk? They are close. They love each other. Henry doesn’t talk because it is the way he deals with the world. The book failed in flushing out these characters. There wasn’t much there past the surface of these characters. We didn’t get to see any real relationship between the boys. We were told, not shown. A lot of times, they didn’t even really inhabit the same scene. When Seth was in the meetings with August, Henry was in the RV (plus, who leaves a kid in the R.V. by themselves. For all the judgements that August was this fantastic father figure, he just left this nonspeaking kid in the car.) Later in the book, Seth is climbing and Henry is with August. The rest of the time, Seth and Henry are in the same scene, but they are just interacting with August, not really with each other. Ultimately, they talk about each other to August, but truly, they don’t have all that many interactions with each other. A gripe I have was August’s affinity for Seth. August gravitated toward Seth the entire book. Sure, August invites Henry to come stay with him so he can go to school, but his primary focus was on Seth. It really irritated me. 5. How does the trip eight years later repeat similar themes of the first trip? What has changed—or who has changed—and in what ways? The author was after the concept that it was now the boys who were taking care of August. While I appreciated the sentiment, I didn’t feel that it carried the latter half of the book. The concept that August was fearful for Seth’s safety did not come across as caring, but that August was a doddering old fool — which was a big change considering it was only 8 years later. Yes, he had Distal Muscular Dystrophy, but that doesn’t turn someone into bumbling. 6. The book asks an important question about what constitutes family. Is family what you are born into, or can you create your own? Family is whatever you make it. Family does not have to be born into. This was the basic premise of the book. The concept was a good one, but I felt the book did not accomplish any nuance with it. 7. Were you satisfied with the novel’s conclusion? No. I thought the book lost its way at the end. The main character August became a caricature of himself. He didn’t seem to act in any reasonable manner — hyperventilating over seeing Seth’s helmet camera, being oblivious to what mist was, as well as not realizing that the boys were going to take him every summer. The last point was the worst. You can not explain away his idiocracy just by saying “it goes without saying”. Also, who doesn’t call Wes? That was completely unreasonable. Henry is his son. He has every right to know where he is and who he is with. You don’t get to make that judgement call. This is not to condone Wes’ behavior — but two wrongs do not make a right. Narration — I do wonder if perhaps the narrator added to my dislike of August. I can’t help but think maybe my eye-rolling would have been decreased if the character hadn’t been portrayed as so doe-eyed in the later stages of the book.